Eternal Orthodox Church calendar for the 12.10 year 2017. 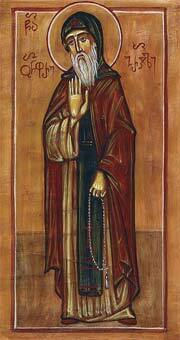 Born in Corinth of parents named John (a priest) and Eudoxia, he was a kinsman of the local bishop, Peter. He was made reader in the cathedral by the bishop while still a young man. Reading the Holy Scriptures, the young Cyriacus marvelled at God"s providence, how it glorified every true servant of the living God and ordered the salvation of the human race. At the age of eighteen, his desire for the spiritual life led him to Jerusalem. There, he entered the monastery of a godly man called Eustorgius, who grounded him in the monastic life. He then went off to St Euthymius, who discerned in him future spiritual greatness, clothed him in the Great Habit and sent him to the Jordan, to St Gerasim, where Cyriacus spent nine years. After Gerasim"s death, he returned to St Euthymius" monastery, where he remained in silence for ten years. After this he moved from place to place, fleeing the praise of men. He lived in ascetic labour also in the community of St Chariton, where he finished his earthly course, having lived for a hundred and nine years. 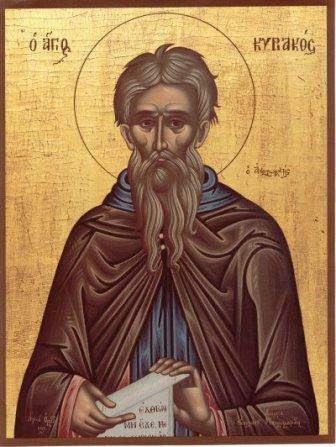 A glorious ascetic and wonderworker, St Cyriacus was massive and strong of body, and stayed thus in great old age, despite strict fasts and vigils. In the desert, he sometimes lived for years only on raw vegetables. He was very zealous for the Orthodox faith, denouncing heresies, especially the heresy of Origen. Of himself he said that, while he was a monk, the sun never saw him eat or be angry with any man. According to the rule of St Chariton, the monks ate only once a day, after sunset. Cyriacus was a great light, a pillar of Orthodoxy, the boast of monks, a mighty healer of the sick and a gentle comforter of the sorrowful. Living long in ascetism and giving aid to many, he entered into the eternal joy of his Lord in 557. Dada was a Persian noble and a kinsman of King Sapor, and Gobdelas was the son of the same king. When St Dada openly confessed his faith in Christ, King Sapor ordered that he be harshly tortured. During these tortures, Dada worked great miracles in Christ"s name, which made such an impression on Gobdelas that he also embraced the Christian faith. The pagan king did not spare his son, but gave him over to harsh torture. Both Dada and Gobdelas glorified God in their patient endurance and many miracles, and gave their souls to God under the tortures. They suffered in the fourth century. With them there suffered - for they had also come to faith in Christ - Gobdelas" sister Kasdoa and Gargal, the chief of the pagan priests. She was at first a reader of the Psatter in the Church of the Resurrection in Jerusalem, but, being beautiful, she was a source of scandal to the sinful-minded. In order not to be a cause of sin in others, Mary withdrew to the wilderness of Souka with a basket of beans and a flask of water. She spent eighteen years in the desert and, by God"s power, never lacked either beans nor water. Disciples of St Cyriacus found her during her lifetime, and later buried her. 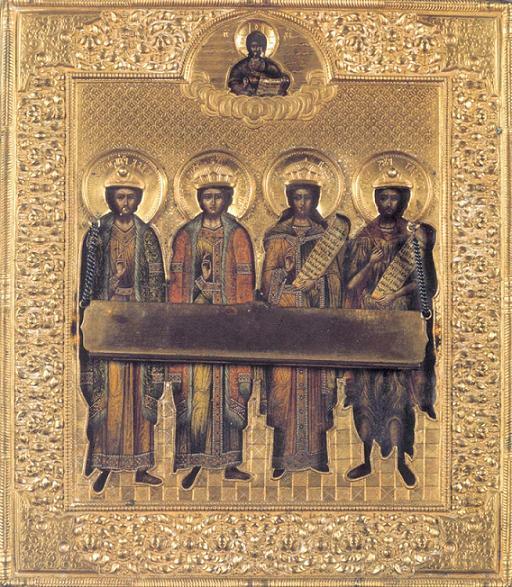 Martyrs of Byzantium (about 80 of them), were burnt in a marine vessel for their firmness in Orthodoxy during the reign of Emperor Valens. Martyr Gudelia suffered for Christ in Persia in the fourth century. By command of Shapur, King of Persia, she was nailed to a tree.